51 published items with the word (s) or phrase LK Bennett in News, Trends, Videos, Photo galleries, Agenda and sorted by "date descending". ​It’s official, LK Bennett is now owned by a company set up by one of its supplier-partners. It becomes the latest prominent name to be acquired by a Chinese business with its Chinese franchisee now in the driving seat. ​Another week, another likely UK fashion brand going under. Liam Gallagher's label Pretty Green is expected to appoint administrators in the week starting March 25 as the weak retail environment claims its latest victim. Mike Ashley wants to buy LK Bennett, will Linda Bennett also bid? It may seem like Mike Ashley has enough on his hands at the moment, between running House of Fraser, his Debenhams ambitions, and the other chains he has acquired. But it seems he's also interested in buying LK Bennett. Links of London, the jewellery chain owned by scandal-hit Greek retailer Folli Follie, is on the brink of collapse, putting 500 employees at risk of redundancy. ...C'est officiel, la marque britannique L.K. Bennett, qui avait dû déposer le bilan le mois dernier, est désormais la propriété d'une société créée pour l'occasion par son franchisé chinois. ...La marque britannique de souliers L.K. Bennett s’est déclarée en faillite jeudi. Les administrateurs ont fermé cinq boutiques et cherchent des repreneurs pour la griffe au réseau international de 200 points de vente. ...LK Bennett avait créé la surprise dans le secteur du textile en nommant en 2016 Darren Topp au poste de PDG. Mais ce dernier va quitter son poste, remplacé par Erica Vilkauls, auparavant à la tête de la chaîne East. ...LK Bennett a annoncé les nominations de Darren Topp, ex-patron du retailer BHS, comme nouveau CEO, et de Michael Hitchcock en tant que nouveau directeur financier. ...LK Bennett sorprendió a todos en 2016 con el nombramiento de Darren Topp como director general de la firma británica. Pero este último deja ahora su puesto y será reemplazado por Erica Vilkauls, ex de la cadena East. ...LK Bennett ha confirmado que su fundadora, Linda Bennett, ha adquirido la participación de Phoenix Equity Partners, con lo que vuelve a la cabeza de la marca. ...Emilia Wickstead, Erdem y Alexander McQueen, muchas veces combinados con ropa más asequible de Zara, Hobbs, Whistles, LK Bennett y Reiss. ...La crisi del retail britannico colpisce anche la catena LK Bennett, in amministrazione controllata dal 7 marzo, che ha annunciato la chiusura di 5 punti vendita e il taglio di 50 di posti di lavoro. ...Der Retail-Experte kommt von LK Bennett. Der bisherige CFO Ron Hemmer wechselt innerhalb des Unternehmens auf die neu geschaffene Position des Chief Strategy & Business Development Officers. ...В конце декабря прошлого года начал работу российский интернет-магазин британского одежного ритейлера L.K.Bennett. Он был запущен совместно с фулфилмент-провайдером eSolutions. ...Британский премиальный ритейлер женской одежды L.K.Bennett планирует открытие еще одного магазина в России до конца года, а также запуск онлайн-бутика. В перспективе двух-трех лет марка откроет еще четыре точки. ...В четверг, 16 марта, британский бренд L.K.Bennett открывает первый официальный магазин в России после мягкого запуска в столичном "Метрополисе" в августе прошлого года. ...LK Bennett hasn’t yet announced its new owner, but it's already taking action to liquidate its US stock and is asking for bankruptcy court permission to begin closing-down sales at its US stores and its webstore. ...Philip Day, the owner of Edinburgh Woollen Mill Group, has withdrawn from the race to buy collapsed fashion label LK Bennett. He had made a last-minute offer for the upmarket clothing brand hours before the deadline. ...LK Bennett could soon change hands to a new Chinese owner as one of its suppliers is understood to have joined the race to buy the premium clothing brand from administrators. ...Fraser, his Debenhams ambitions, and the other chains he has acquired. But it seems he's also interested in buying LK Bennett. ...seemed to be a good choice having held senior roles at some of the UK’s most respected retail businesses, including LK Bennett and John Lewis. The story of LK Bennett’s ownership has come full circle with the company confirming today that founder Linda Bennett has bought the stake held by Phoenix Equity Partners. ...founder returns to spearhead a brand that has lost its way and now Theo Fennell, like the founders of Jack Wills and LK Bennett before him, is back to offer a founder’s vision to the brand. ...LK Bennett is officially launching its first store in Russia on Thursday (March 16). 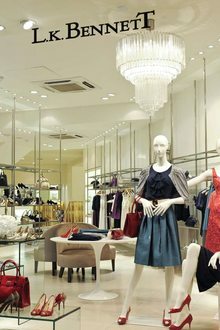 The debut follows a soft launch last August at the Metropolis mall in Moscow as the UK firm targets faster growth abroad. ...LK Bennett has announced the appointments of Darren Topp, ex Chief Executive of collapsed retailer BHS, as new CEO and Michael Hitchcock as new Chief Financial Officer. ...The accessible luxury brand L.K.Bennett is working with British luxury designer shoe brand Bionda Castana on a limited edition shoe collection, due to launch globally on February 10th, 2016.